Samsung gear 360 2017 edition can record in 4K or broadcast live video in youtube in 360-degree view. * 360 Video Editor is not available for macOS computers. Galaxy S8, S8+, S7, S7 Edge, Note5, S6, S6 Edge, S6 Edge+, A5/A7 (2017) running Android 5.0 or later. iPhone 7, 7+, 6S, 6S+, SE running iOS 10.0 or later. The Gear 360 has evolved to let you record in 4K or broadcast live, and then make it your own with the Samsung Gear 360 app. And with the Gear 360's smaller size and redesigned, easy-to-grip body, memories aren't the only thing you'll want to hold onto.Go live with Gear 360.Live broadcast moments you want to share with family and friends, whether it's a special event or just a look into your day-to-day activities. 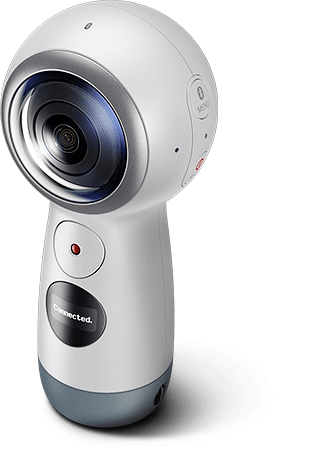 It's simple to set up: pair Gear 360 (2017) with your smartphone or PC, choose a platform to stream to, and provide a real-time peek into your life.vice provider. Easily shoot and share Add a personal touch to your 360 content. 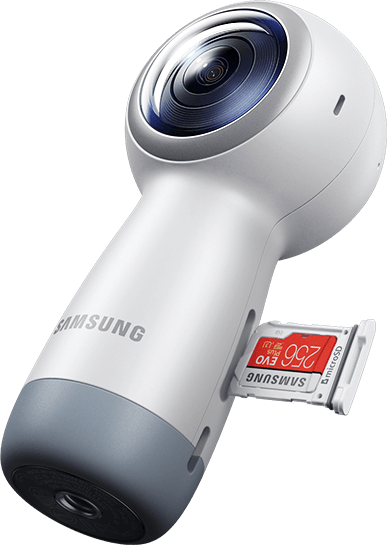 The Samsung Gear 360 app allows you to switch up the view in a few taps, with multiple modes to choose from. Then, when you're ready to debut your new work, it's simple to convert 360 content into a standard video or photo format to upload wherever your audience is. Change the view You don't need a special lens to make your content unique. Choose from five viewing modes in the Samsung Gear 360 app to easily turn your video or photo into a mind-bending masterpiece.